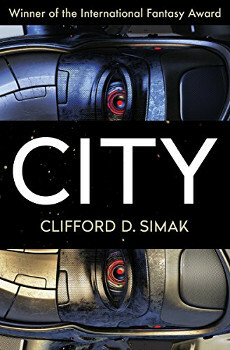 I read City by Clifford Simak recently. If you haven't read it, it is a dystopian cold war era novel in which man abandons the cities due to fear of nuclear war. Society breaks down as everybody lives in isolation, population dwindles, and eventually most humans abandons the earth, leaving dogs that can talk as the superior species on the planet. The dogs institute a utopian, socialistic society in which all animals are vegetarian, and there are no more prey animals at all. The book is a series of short stories, presented as fables or campfire stories being read by these intelligent dogs, who generally believe the stories are fantasy and that this weird species called humans never really existed. It's a terribly pessimistic view of humanity, in that the last remaining humans on earth leave the planet because they are violent by nature. They can't not kill other things, so they can not peacefully coexist in the dogs' non-violent society. There is actually a lot more going on with the book, so you read it. However, the pessimistic tone got me thinking about social media. Are we hard wired to be assholes on social media, much the same way the humans in the book were hard wired to be predators? 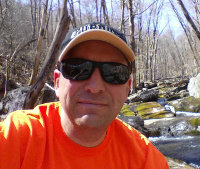 Is there any hope that Twitter or Facebook can ever be generally pleasant places to hang out, without spending significant time hiding, blocking, and otherwise managing the assholes that turn up in any conversation? How would the dogs in the book deal with Twitter? I suspect they would burn it all down, if they weren't pacifists.